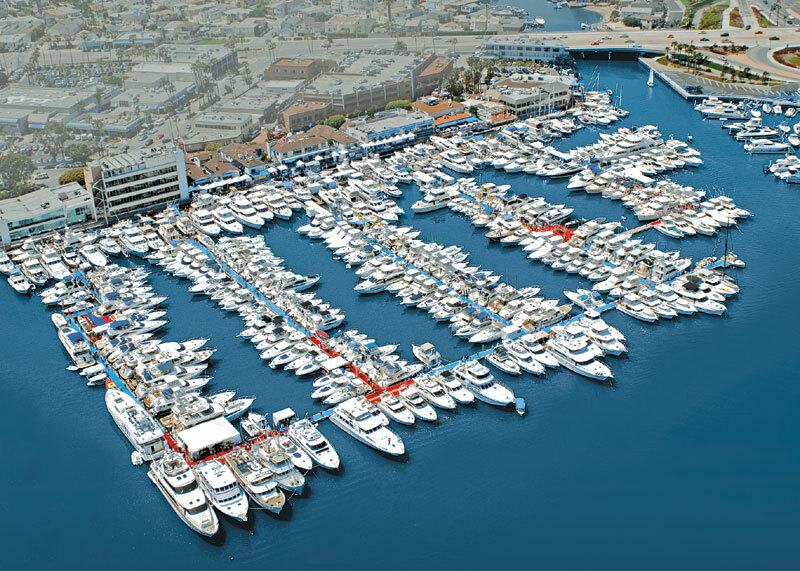 NEWPORT BEACH — The largest collection of big yachts west of the Mississippi is returning to Newport Beach for the biggest in-the-water boat show in the West: the 39th annual Newport Boat Show, April 19-22 at Lido Marina Village. The 39th annual exhibition is California’s premier big boat and yacht show, presenting more boats in the water than any other event in the West. This year, show-goers can step aboard and compare the unique features of more than 200 pleasureboats — including brand-new models making their West Coast debuts and ocean-tested brokerage yachts that come pre-loaded with sought-after amenities — displayed in the water at Newport Harbor. The Newport Boat Show offers a rare opportunity to get an up-close-and-personal look at many head-turning multimillion-dollar yachts, along with a wide selection of 35- to 65-foot pleasurecraft — including sportfishers, long-range trawler yachts, sport yachts, family cruisers, sailboats and motoryachts. In all, the show will feature more than 400,000 square feet of floating dock exhibits and boardwalk displays, plus a huge selection of boating accessories, electronics, gear and services. Come to this year’s show, and you’ll see larger yachts that come equipped with a wealth of creature comforts and the latest-available high-tech amenities — such as multiple large flat-panel video screens and cutting-edge electronic entertainment systems; gourmet galleys outfitted with granite countertops, gleaming stainless fixtures and high-end appliances; designer-created interiors trimmed in buttery-soft leathers and warm, exotic woods; multiple helm station control panels that rival those on jet aircraft; plus, wireless remote vessel controls, onboard camera systems, auxiliary power generators and worldwide satellite communication systems. And you’ll find a wide variety of midsize and smaller pleasurecraft equipped for everything from weekend cruising to serious sportfishing and long-range offshore adventures. This year’s showboats include the 2012 Sunseeker 63 Manhattan, a boat that packs innovation, luxury and performance into an exceptionally graceful frame. Interior options offer an upper or lower deck galley, five staterooms with a full-beam master stateroom amidships, large panoramic superstructure windows and plenty of space for entertaining aboard. The Titan 75 Tournament DLX sportfisher, making its debut at Newport, offers a 320-square-foot cockpit that would be any serious sport angler’s dream. This distinctive luxury yachtfisher is equipped with a Seakeeper stabilizer system for maximum cruising comfort and provides an exceptionally quiet ride, regardless of speed. Offshore Yachts’ flagship 80 Offshore Voyager, also coming to this year’s show, is a “yachtsman’s yacht” with an enclosed wheelhouse, multiple inside and outside entertaining areas, a single-level main deck and a beautiful interior accented by Brazilian cherry wood sole. The 79-foot Johnson Cockpit Motoryacht, appearing at this year’s show, comes loaded with amenities and is ready to cruise — with a large California Deck, four staterooms, crew quarters and a full complement of the latest cruising electronics. The all-new 31 Ranger Tug will also make its Newport Boat Show debut this year. This single-engine boat with a command bridge offers both surprising fuel economy and enviable power — with a 300 hp D4 Volvo diesel engine that provides a cruising speed of 16-plus knots. The interior layout includes two staterooms and two heads, and the standard equipment includes bow and stern thrusters. Like its popular Ranger Tug sisterships (also featured at this year’s Newport Boat Show), the 31 Ranger Tug is totally trailerable. No matter whether you’re searching for the latest yacht, the newest marine electronics and gear to outfit your present boat, or essential yacht services — including marine financing and insurance — you’ll find what you’re looking for at the Newport Boat Show. For more than three decades, the Newport Boat Show has become well known as the West Coast’s total one-stop shopping experience for boating enthusiasts and potential buyers. This is one boating event that is a definite must-see. The Newport Boat Show’s conveniently accessible venue — Lido Marina Village — is located at Via Lido and Newport Boulevard in Newport Beach, one block south of Pacific Coast Highway. Show hours are: 10 a.m. to 7 p.m. Thursday through Saturday; 10 a.m. to 5 p.m. Sunday. Admission is $15 (credit cards accepted) for adults and free for children 12 and younger. Free offsite parking and continuous shuttle service will be available. Visit newportinwaterboatshow.com for complete details.